A great Fall climb with a friend that became an epical descent. Bob on the summit of Mt. Whitney, California, 14,595 feet. Well said, but when you’re so focused on the summit of a peak, that bit of detail can sometimes be overlooked. Cathy Gildea at the belay on a fine Fall day on Mt. Whitney back in 1997. My partner, Cathy Gildea, thought it might be a Fall adventure to climb the 3,000-foot east face of Mt. Whitney, the tallest mountain in the lower 48. Though not technically difficult, the location, size and height require some fairly competent mountain skills. The plan called for a ten-mile approach to the base of the mountain – including bushwhacking through some stubborn willow fields. Cathy and I made to the base of Whitney in pretty good time and were able to set up our camp and enjoy the evening. Cathy and I had been climbing together for about five years and had been through a number of great ice climbing, mountaineering, rock climbing and fly fishing adventures, but this was our biggest peak together. We had both climbed Denali prior to Whitney, and she had even summited Aconcagua – a peak that I didn’t summit until 2008. Watching the moon rise between the legendary Keeler Needle and Mt. Whitney. Other than the high altitude – for sea-level, Silicon Valley types – the climbing was moderate to easy. We hit it early, slept well and got on the mountain just after first light. We had water and snacks and were looking forward to a great day. Cathy Gildea on Mt. Whitney. We made good time on the East Face, uncharacteristically finding the right route and staying on it. We were cruising through most of the climb until we got caught behind a slow party. Trying to be conscious of time, I bypassed them on a much more difficult but parallel route. At this point, leading a difficult crack at over 14,000 feet seemed like the logical thing to do. My confidence came from that fact that Cathy was ever the watchful belayer. It’s what makes her a great Mom to two young lads these days. Still panting like a dog at my belay, I brought her up and we continued the regular route ahead of our other climbing friends. But the day was slowly, but surely, taking it’s toll. Cathy had taken some ibuprofen for various aches and pains that morning and was trying NOT to drink any water for fear of slowing us down. It seemed like a good idea at the time. But, as we continued to climb into the warm Fall afternoon, she began to get dehydrated. We moved quickly over some of the easier ground and soon found ourselves on the summit and heading for the descent route known as “The Mountaineers Gully.” We hit the gully with rapidly vanishing daylight, feeling home free with only a 2,000-foot descent ahead of us, when Cathy grew ill and began vomiting. About every 10 to 20 minutes, she would have to stop and expel. Darkness quickly over took us, and the night began to grow grim. Being in the gully, we had no moonlight. Even the beam of my headlamp was being consumed by the dark. At one point, we came to edge of a 200-foot cliff that we only knew was there because we could feel the updraft. Still, we struggled onward and downward for hours until we reached a small tarn at the base of the mountain. Still 30 minutes for our camp, we drank deeply from the small lake figuring that it would take Giardia a few days to catch us. As she drank, Cathy began to feel better and we both learned a lesson about ibuprofen, hydration and big mountains that day. We were happy to watch the moon rise another night from the comfort of our sleeping bags. A New Blog. An Old Pursuit. After 30+ years of climbing, skiing, running, swimming, fishing, biking, music, career, marriage and friendships, it’s funny how mountain climbing can be such a great metaphor for it all. At least it helps me grasp some understanding. In my blog, I hope to shed light on, and make light of, those foibles in life that make us what we are. In climbing, as in life, there are those moments that strip away all pretense and expose who we really are. When the only way out is up, and it’s not a good option but we have to go with it. At those times when you realize that you’ve crossed over from total commitment to being totally committed regardless, something inside a human soul can shine and make all the difference. I hope to be able to reflect some of those moments and, quite possibly, really embarrass some old friends. In the mean time, please be patient as I work to master WordPress and I’ll see what I can do to create a little humor, some good gear recommendations, highlight some great and not so great travel, and help us all get through another day by realizing that we’re all connected. But it’s those hurdles we clear on a daily basis that can make those connections a bit difficult to decipher and feel. 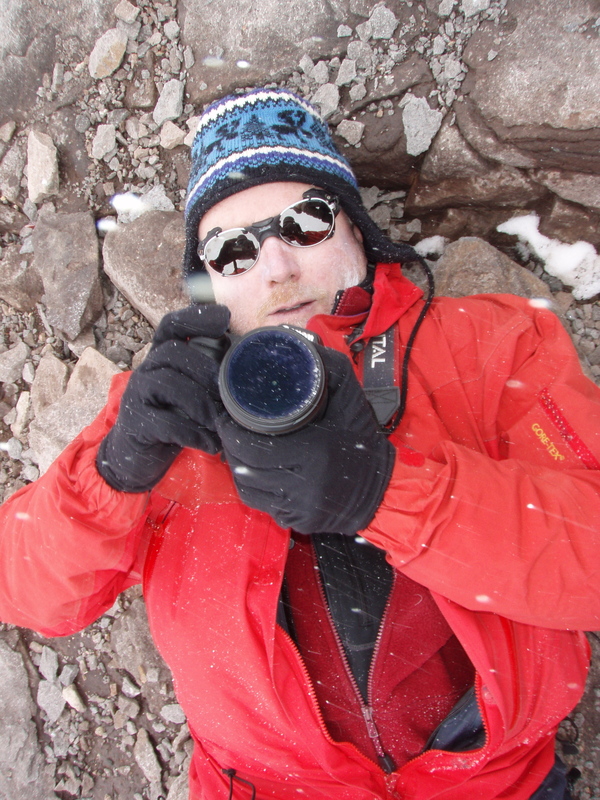 The shot accompanying this post was taken as I lay on the summit of Aconcagua in Argentina. Trying to breath at 22,900+ feet, watching a raging storm rolling in, and thinking of the great red wine and BBQ in Mendoza. It was my third attempt and I learned a bit about preparation and tenacity at the same time. I guess I’m a slow learner. A great Fall climb with a friend that became an epical descent. The big step is here.